If your car is more of an original Enterprise model rather than the retrofitted version, put this Starship Enterprise Injection Molded Emblem on it and be a part of Starfleet. This emblem has a shiny chrome-like finish and features an aggressive, but peel-away adhesive backing. Let the other cars know that you are the Captain on your tiny 4-wheeled bridge, and that you love great sci-fi. This emblem measures 3 1/2″ long x just over 1 1/2″ wide. It won’t give you warp speed, but it will look awesome on your car. It is only $7.99(USD) from ThinkGeek. 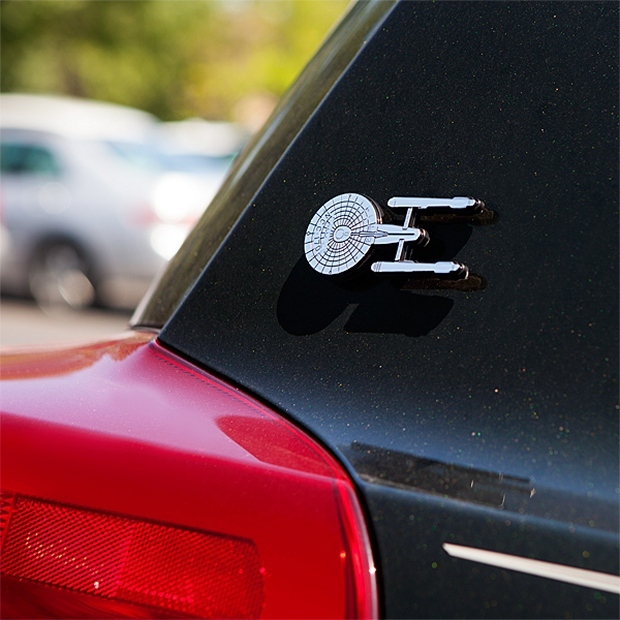 Fly your geek flag proudly all the way to the final frontier… or to your job, or wherever.